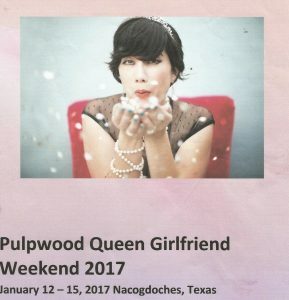 Was invited to the Pulpwood Queens Literary Festival in Nacogdoches, over near the Louisiana border. 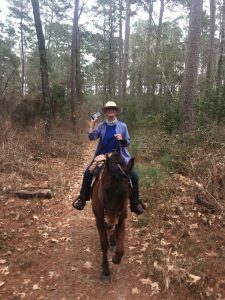 April Baxter volunteered to go with me, since her son lives there, then we said ‘Why don’t we take the horses and ride in the Davy Crockett National Forest?’ And so we did. I read and gave a short talk and signed books, they were great. Women wearing glitzy bling and cool sparkly crowns. Much fun. That was Saturday. Then April and I hauled the horses to the National Forest on Sunday and rode. It was wet. Wet. Wet. The whole time we were texting June and sending her pictures to show her how wet and rainy it was. 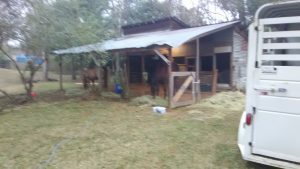 April’s son Ryan and girlfriend Lilly had a house and we put the horses in their chicken coop. They were content. Made a mess. Wish I had a picture of Ryan and Lilly but I forgot. Ryan was in the Marine Corps, a mechanic, so he fixed my defective trailer lights in about 15 minutes. 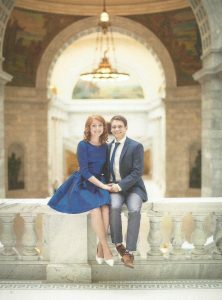 And just for the record here is my great-nephew Ben Jiles and his fiancée Natasha, they will be married tomorrow! In Utah. Happy and blessed everything you guys.